Help! I Have an Injured Bird! JOIN ME IN READING AN ARTICLE ABOUT STEVE STONE WRITTEN FOR AND PUBLISHED BY OUR GOOD FRIENDS AT MIDTOWN MAGAZINE PUBLISHING! not a large rescue business. People who care, putting the animal’s interest first! CLICK HERE IF YOU HAVE AN INJURED BIRD THAT NEEDS RESCUE!! 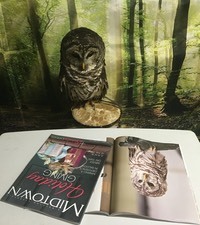 We help rescue birds of prey, rehabilitate injured raptors, release rehabilitated birds, provide a refuge for unreleaseable birds, and we educate the public about wild raptors in the Raleigh, NC area and beyond. The American Wildlife Refuge / Raleigh Raptor Refuge is an all volunteer staffed 501(c)3 non-profit corporation. Only licensed personnel and those learning and working with our licensed caretakers handle our birds. We provide necessary care to rehabilitate temporarily injured raptors and release those able to care for themselves back into the wild. For birds that are not releasable, we provide refuge facilities and are networked with other rehabbers and organizations all over the country to place birds. We also provide educational presentations to the public. Private events for educational purposes to youth groups, service groups, scouting groups, home schools, private parties, parks, libraries, schools, and other groups are available for a nominal fee, and can be tailored to your curriculum. All proceeds from shows and any and all donations are spent entirely on the care and feeding or the birds and the maintaining of the refuge organization. No salaries or fees are paid to the volunteers. Veterinary care is generously provided to the American Wildlife Refuge by Dr Dan Johnson of Avian And Exotic Animal Care. If you need to report an injured bird, please do not send an email. We are not open to the public, so our actual address is not available. We closed our education center as the rental vcost was too high to maintain and still care for the birds on our limited income. Please send mail to the UPS store address listed above, and for educational events, please call for your options of locations.